There are rather startling statistics on burglaries these days. For example, many studies show that almost 70% of home break-ins occur through the entry door. That’s right; intruders are this successful at forcing their way inside by striking near the deadbolt and rattling the frame loose from the door. All it really takes is a few forceful kicks to break away the frame or damage the door panel and lock so it can be opened. Unfortunately, many homeowners don’t realize their one- or two-lock entry door isn’t fortified enough to keep a persistent bad-doer out. In fact, more than half of all homeowners live in homes with doors which include only one lock area. The hard fact is that, in the year 2018, this just isn’t good enough, anymore. Here at Brock Doors and Windows, we want to help keep our neighbors in Brampton, ON, and the surrounding areas safe. And, there are more ways to accomplish a secure home than solely adding more locks to your entry door. Check out these four tips! Firstly, let’s address this lock issue. Having one deadbolt on your door isn’t always enough. Here at Brock, we offer multi-lock options so you can choose the level of security you want. Multi-lock systems are used to secure the door along the full edge—not just the one near around the door handle. The quality of your door will affect the ease with which it can be damaged. If your door is old, outdated, or in poor shape, it is time to replace it. Sadly, entry doors with large windows present a potential risk to your security—especially if you do not have a multi-lock system. Many, many robberies have occurred easily because the burglar was able to break a small piece of the door window, reach inside, and let himself in. So, when you are entry door shopping here at Brock, express this concern to our professionals and we will be sure to help you find the best entry door in Brampton, Ontario you’ll love—that does allow in natural light—without compromising your safety! Statistics show that burglars and intruders tend to skip over the homes with motion lights and alarm systems (if they see the alarm company sign on the windows/door). At the first sign of an alarm or floodlight—they’re gone. Don’t allow your landscaping to create perfect hiding places close to your windows and doors. If the potential intruder can’t inconspicuously break-in, he will likely decide to pass over your home. We know you want to keep yourself and your family as safe as possible. 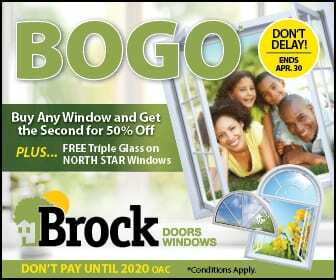 Come check out our options here at Brock Doors and Windows. Safety begins with your entry door!